Lookbook: Strolling through the city…. My city look in February is unusually spring-like, because although we were allowed to admire a snowy landscape for a short time this week, it is quite warm at the moment. The perfect weather for my favorite wool coat and my boots. Incidentally, I found the great skirt at Missguided. With the round rivets, he is an absolute eye-catcher, as may the rest of the look is more restrained as I think. At the moment I’m very busy, because I work 100% and besides private obligations I also run this blog on my own. However, I do this for fun and as compensation for my otherwise rather top-heavy work in the law firm. Making something creative in my free time is for me, as for others, membership in a sports club or similar. In addition I have the luck to deal throughout blogging with other favorite topics of mine such as beauty, fashion, travel and all sorts of lifestyle topics. Incidentally, I also find it very important not to lose the fun while blogging. Of course, sometimes you have days where you just do not feel like it. Then you should treat yourself to a break and not try to force something. Anyway, I think that creative content is not enforceable. I also had to postpone shootings, both of looks and products, because I simply did not have the inspiration to do so. For me on such days a little break is enough that my ideas come back soon. Do you know this too? Now again to my outfit. I wear my cuddly white cap from OVS to the gray coat of New Look Petite. The blouse with batwing sleeves is from New Look. The skirt of Missguided. I bought the shoes from Zalando some time ago. Just a single color accent, such as the wine red of the blouse, gives outfits in muted colors a great twist. How do you like the look? Do you like studs as an eye-catcher or not? Mir gefällt vor allem die Farbe super gut. Absolut cooler Look! Ich mag Nieten und auch die Mütze finde ich total cool! 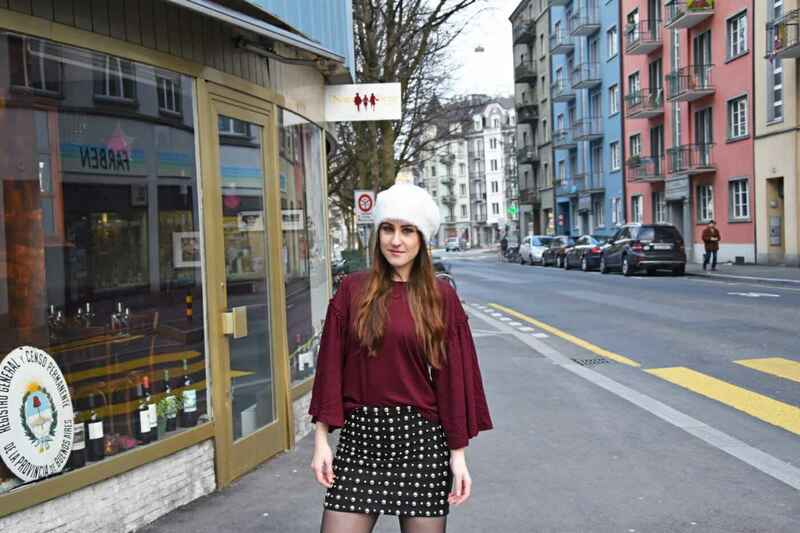 Dein Outfit ist mega schön – ich liebe die Farbe und den Schnitt von deinem Oberteil 😉 Das kreative Loch kenne ich auch nur zu gut und bin da aber auch der Meinung, dass man dann einfach mal eine Auszeit benötigt. Man kann Kreativität nicht erzwingen und darauf vertrauen, dass sie irgendwann von alleine kommt. Danke dir 🙂 Ja absolut. Der Look gefällt mir gut, da ich Nieten mag. Super chic and edgy! I love it dear, especially the statement wine red blouse and wool coat combo. * PR-samples: products, which are made available to me for test purposes. A selection I introduce you here on the blog. My opinion is always objective. * Sponsored Post: For this post I receive a consideration from my cooperation partner, which I have selected for a cooperation. I only choose partners, which fit me and whose quality I am convinced.